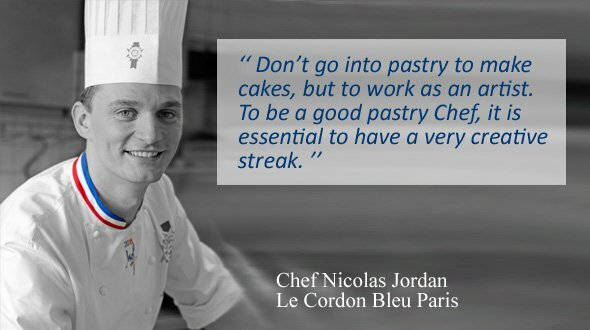 Where did your passion for pastry, and your desire to make a career out of it, come from? Choosing pastry came very naturally, I always had a much sweeter tooth than a savory one and was fascinated by cake baking. You have travelled during your career, to Canada for example. Why did you choose Canada, and what did you get out of your time there? I wanted to learn to speak English and I was attracted to Canada as there are many people who speak French there and it is a beautiful country with wide open spaces. I learnt a lot there, especially working with Christian Faure, who is “One of the Best Craftsmen in France, Ice and Ice Cream (Un des Meilleurs Ouvriers de France - MOF)”. I then had the opportunity to work as a Chef Instructor at Le Cordon Bleu Ottawa, in Canada, which fitted in perfectly with what I wanted to do. You were awarded the title “One of the Best Craftsmen in France, Ice and Ice Cream (Un des Meilleurs Ouvriers de France - MOF)”. Why did you want to take part in this prestigious competition and how did you prepare for it? Working with Christian Faure, who already held the title of One of the Best Craftsmen in France, Ice and Ice Cream (Un des Meilleurs Ouvriers de France - MOF) made me want to take part in the competition. I started by taking part in national competitions which enabled me both to train and to become more confident, to persevere and enter much harder competitions. The preparation for One of the Best Craftsmen in France (Un des Meilleurs Ouvriers de France - MOF) competition takes a long time and many years of hard work. To give you an idea, I had to perfect 70 recipes for the duration of the competition! What are the main qualities needed in order to become a good Chef? In my opinion, curiosity and the ability to work with others are essential. After all, this job is all about team work and being open to sharing. What advice would you give to somebody who is thinking of becoming a Chef? Don’t go into pastry to make cakes, but to work as an artist. To be a good pastry Chef, it is essential to have a very creative streak. It is also important to enjoy working with ingredients, as they are the basis of all creations. It is only natural that a pastry Chef who loves his work will produce beautiful creations. What do you think of the recent wave of interest in pastry (TV shows, competitions…)? I see it in a positive light. It gives a good impression of the profession. In the past, becoming a pastry apprentice was only for those at the very bottom of the class and it was generally seen in a very bad light. Today’s wave of interest enables young people to dream and to create a profession for themselves and even encourages people to think about a career change. In the long term, this will enable our artisans to continue their trade and to gain ground in the industry which can only be a positive thing. I love a well made and simple rum baba. Brittany galettes are also a favorite of mine. So simple yet so good! Is there one ingredient in particular that you enjoy working with? I love working with vanilla. I would go so far as to say that it is a product that makes me euphoric. I love its taste, its smell and its multitude of uses. Which Chefs inspire you on a daily basis? There are, of course, Chefs whose career paths I really admire, such as Philippe Conticini for example, but on a daily basis, I want my work to have my identity, not that of someone else. I believe it is important to know how to maintain your own personal style. Thank you for giving us this interview Chef Jordan!